Here All Along – Screening Love! Readers familiar with the Sloan Brothers of Melanie Shawn and the Sullivans of Bella Andre would enjoy the Kelly Brothers with equal fervor. Crista McHugh’s Kelly Brothers are an amazing bunch of talented and super loving hunks, raised by a super awesome mother and the family dog Jasper. I’ve read and re-read all of them a few times over and enjoy them more each time. Kelly brother number 7, Gideon has all the charm and sexiness of a movie star and he is at the pinnacle of his career. Yet rooted to the ground by his family values and love for the humanity, he’s hard to resist and a temptation that every woman wants a bite of. But “The Kid” has only eyes for Sarah Holtz and his heart belongs to her now and forever. But convincing Sarah is a gigantic job that requires a screenplay skillfully written and choreographed with loyal characters and family support. Sarah has seen the pinnacle of stardom and the rock bottom depths of depression and drugs. For her Gideon is her savior and life support, but she wants to stand on her own strength before she can stand on equal footing with Gideon. I love Crista and her penchant for weaving stories that leave her readers with laughs and love, tears and heartbreaks, meddling friends and staunch supporters. “Here All Along” had me in splits as Gideon along with his co-star Gabe try to rope in Sarah, the interaction between these two is plain hilarious. Gideon as the superstar yet the vulnerable man in love have us rooting for him all the way. And Sarah as the girl who has lost everything, yet as the woman who may have a chance at everything is just a classic beauty of courage and determination. I just loved her and she was “Here All Along”, right next to her future and took her a while to accept the love and trust she was lucky to have found. 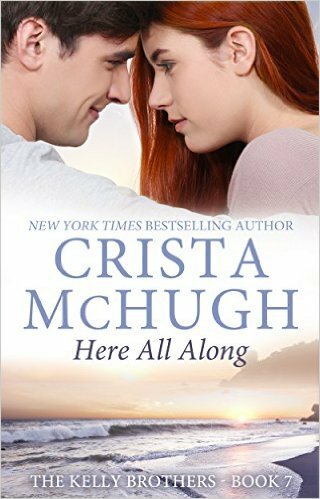 What can I say about Crista McHugh – she’s been and will be one of my all time favorite writers. She writes such genuine love stories that are so relatable to our daily lives and makes reading them such a pleasure. Simple, classy and charming creations are her fictions.